It is a cliché, but in my ten years in the university sector, the only constant has been change. It seems that every new government, every new education minister wants to leave its own on the university sector. The current minister for education Christopher Pyne is no exception. He sees himself as a person of vision, reshaping the Australian educational landscape, with a number of reviews in place for all levels of education. Two main points are emerging in relation to his vision for higher education. The first is the deregulation of the fee structure of student places. Universities currently in receipt of a certain level of government funding per student will be able to charge whatever they like over and above that amount. While the student may be able to cover this through a student loan facility (HECS/FEE-HELP), it would allow those universities with the best reputations (the so called Group of Eight) to charge more for their courses, up to what the market will bear. 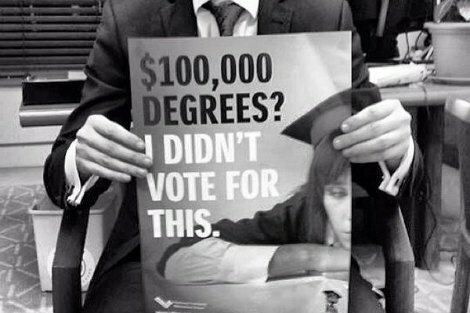 This has given rise to the 'shock' headlines regarding $100,000 degrees. While this may happen in some areas (law, medicine, dentistry etc.) the Government argues that a more deregulated environment will ensure enough competition to keep prices down. However there is little evidence that this will be the case if the US experience is anything to go by. The other major reform is to extend Commonwealth supported places to private providers, institutions which are currently non-government funded such as private business colleges and theological colleges. In order to fund this expansion of government funding to a broader market, the level of funding to the existing universities will be cut as part of the process of deregulating fees. The big debate is over what level of funding these private colleges will attract. Will they receive exactly the same level of funding as the university sector, or will it be discounted, and if so, to what level? For the Government the funding of private colleges is consistent with its attempt to promote competition in the market place and hence keep fee levels down. If this is not enough for the higher education sector to absorb, the Government is also pursuing a more aggressive approach to the question of research funding. Drawing on results from the ERA research audit, universities are being asked why the Government should provide research funding where a university is not achieving a certain level of research excellence. The likely outcome is that increasingly universities that do not score well will simply no longer have access to government research funding. They will become, to all intents and purposes, teaching only institutions. The big fight will be over what level of research quality will be enough! The end result will be, if not a binary system, perhaps a ternary system of higher education. There will be the Group of Eight, research intensive universities which will continue to attract the giant's share of government research money while charging higher fees commensurate with their reputations; there will be teaching intensive universities with no access to that funding, in severe competition with the private colleges; and there will be a middle group fighting over the research funding crumbs left over from the Group of Eight. Certainly we are likely to see the end of the unified system introduced by the Dawkins' reforms of the 1990s. There are real questions whether all our existing universities will survive in this emerging environment. Of course much of this will depend on how the Senate responds to the legislative changes needed to bring all of this about. The Government has already suffered one defeat, with the Senate rejecting a proposed 'efficiency dividend' which would have cut millions of dollars from the sector. The fate of fee deregulation and opening up of the market to private providers is yet to be determined. As a final observation, the proposed changes place many theological providers in an interesting situation. We have seen a number of theological colleges enter into relationships with universities to assist with their financial bottom line, in the face of falling support from their church constituencies. If private providers are to receive government funding directly, we could see some of these arrangements begin to fall apart. Gaining direct government funding may turn out to be a better option than what they currently receive from their relationship with a university. Time will tell. Neil thanks. Is it not a case of various types of providers joining the largely but but solely public universities which are now funded. For example ACU is a funded private university, which is fine by me. Among those seeking funding are the Government owned TAFEs which offer HE qualifications as well as the groups you mention. The change proposed is not about public v private but university to non university. Taking the government's position on financial support for the vehicle manufacturing industry as a guide, why should anyone expect government assistance for private tertiary education providers? Alternatively, the question becomes: Why would the government support the private tertiary education industry while refusing financial assistance to the vehicle manufacturing industry? If the vehicle industry goes belly up, Australia won't have to go without vehicles: we can import from Asia as NZ does. And if Australians can't afford a tertiary education, employers can import graduates, too. Is this what we want to do?